In 2008, I was contacted by David Stork, who is a physicist, engineer, art historian and author of numerous books and journal articles. He requested my permission to analyze one of my paintings, Three Way Vanitas, in the hopes of converting it into a hologram to study the numerous elements of perspective in the piece. I was hesitant to have my image undergo such close scrutiny, but in the end I agreed since he and his team have also done extensive analysis of other art historical works, studying their use of perspective. I felt myself in good company when I saw he had also analyzed paintings by Caravaggio, Van Eyk and others, knowing that he found problems with their perspective too. 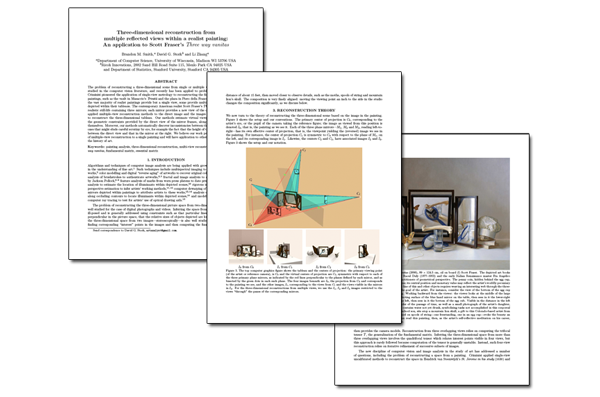 I have included his essay, which is highly technical but very interesting, along with a link to another site which includes further in depth study of perspective in other artwork. You might want to take a look.